With the popularization of selfies and visual-focused platforms like Instagram, it's no surprise that social media has become a crucial consideration for the beauty sector. Pinterest is another good example - Pinterest has previously labelled itself 'the largest beauty platform in the world', with more than 38.5 million unique viewers of hair and beauty content. If you're working in the beauty sector, you're likely already aware of the significant sway social media can have, and the potential benefits of tapping into such opportunities. 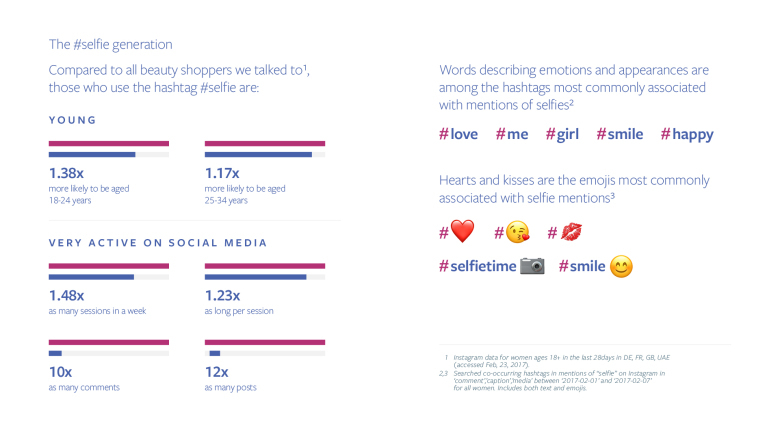 To further underline this, Facebook have published a new report which looks at the evolving beauty discussion on Facebook and Instagram, and the ways marketers utilize such insights to best effect. And the findings raise interesting considerations for other sectors too - here's what they found. For the new report, Facebook analyzed their own data and commissioned GfK to survey 3,648 female beauty shoppers across the UK, France, Germany and the UAE, a fairly large data pool to draw from. Their first major finding relates to the ubiquity of smartphones, and how being always connected provides new opportunities for marketers. "Six in ten beauty shoppers surveyed agree they could not live without their smartphone. 45% of beauty shoppers agree that their mobile device (smartphone or tablet) is quickly becoming their most important shopping tool, and the percentage is even higher for Millennials (55%)." That's no real surprise, people are using their mobile devices more and more, for an ever-expanding range of purposes. 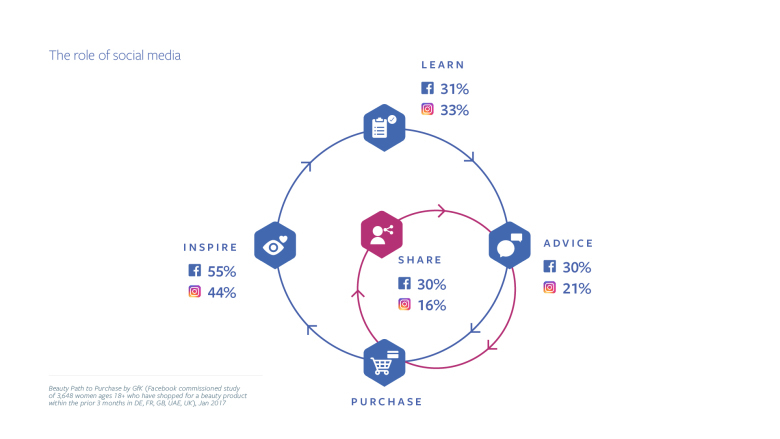 But Facebook's research also showed that social media is playing an increasing role in providing inspiration, in particular, with more than three quarters of beauty shoppers admitting to being tempted by a product that they didn't intend to buy because they saw it on social. That increased opportunity for exposure underlines the broadening role social platforms are having on the discovery process - if you're in the beauty sector, it may soon be arguable that social is as important to discovery as traditional SEO, and should be garnering the same focus in your marketing efforts. And while these findings are, of course, beauty specific, it is interesting to note the increasing reliance on social platforms for discovery. It's worth noting too that Facebook now facilitates more than two billion searches on their platform every day. Pinterest sees two billion per month. Google, of course, still leads the way overall, with an estimated 5.5 billion daily queries, but it's worth considering the implications of this increased discovery capacity in social, particularly for visual-based products. Another interesting consideration in the rise of selfie culture is the effect that may be having on the wider psychology of the generation. For example, most older people I know are not overly keen on having their photos taken - it's not something that they've grown up with, and generally, they have an increased tendency to see selfies as non-flattering and flawed. But younger generations have grown up on selfies, which may actually give them a stronger sense of self-worth and understanding. If you're looking at images of your own face all the time, you're more likely to be accepting of how you look, including your flaws, which could actually galvanize self-esteem. There are varying, conflicting reports on such impacts - some suggest teens feel under more pressure than ever to live up to unrealistic beauty standards portrayed on social media accounts, while others show younger users are growing more confident with their self-image because of the selfie trend. Really, it would appear to have the power to fuel both elements - but interestingly, Facebook's data shows that mentions of words related to natural beauty grew on Facebook by 38% year on year(from Nov 2015 to Nov 2016), which may actually underline a wider, more positive, psychological trend. In terms of how social influences actual buying behavior, Facebook's data shows that despite conducting more of their research online, 68% of beauty buyers still purchase in store only. But the research process is still a critical consideration - nearly three quarters (72%) of beauty shoppers indicated that they have been influenced by digital at some point in the path to purchase. "Millennial women (aged 18-34) are particularly keen on using Instagram for beauty inspiration. 37% of women under 34 years old say they use Instagram to be inspired by looks and beauty trends compared to 25% of women over 35 years old. Young people are also more likely to watch online beauty videos; a quarter of beauty buyers aged 18-34 watch videos to inspire them (24%) compared to 16% of those aged 35-64 years old." Again, many of these findings would be expected, but it's important to note the rise of social research which accompanies in-store buying. Social platforms are working to improve their measures to directly link such behaviors - Facebook, for example, is refining its Conversion Lift metrics, which match Facebook ad delivery to actual in-store sales, via point of sale data. As those measurements evolve, we'll have more ways to directly correlate online and in-store actions, which is crucial to fully understanding social ROI and maximizing marketing investment. 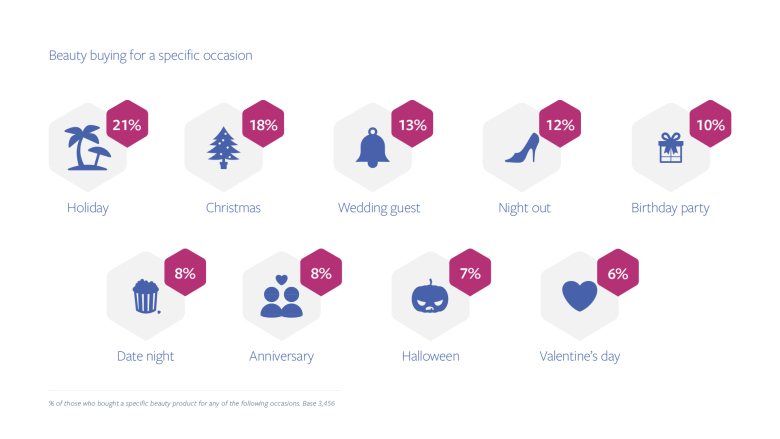 And one final key note - Facebook's research shows that special occasions drive beauty research and purchases. "An upcoming holiday is the number one occasion for people to buy a beauty product, followed by Christmas, a wedding invite and a night out." There are some interesting insights here, and Facebook is also using the study to direct beauty brands to their dedicated 'Mobile Makeover' mini-site, which provides a range of resources for those in the beauty industry. The site includes a range of different ideas and tips for those looking to maximize their beauty-related campaigns, and is well worth a look. You can check out the full "Selfies and snail slime: Analyzing beauty conversations on Facebook and Instagram" report here.